With the introduction of their heated jacket, DeWalt also introduced a USB power source that could be used to power USB devices such as phones and MP3 players. However, the DeWalt USB Power Source was not compatible with the older DeWalt Pod-style batteries, thus leaving a void that PoweriSite is happy to fill. PoweriSite attaches to DeWalt 12-18V pod-style batteries and converts the volts down to the 5-volts needed to power your USB powered devices. 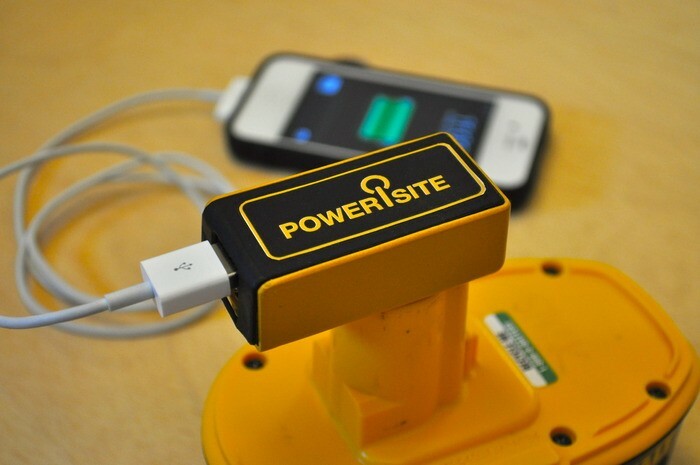 The PoweriSite can deliver a full 3.1amps of power, which is enough to charge/run power hungry devices like iPads and other large tablets, and with two USB ports you can charge two things at once. The PoweriSite is currently on Kickstarter with a goal of $11,000 with three days to go and they need less than $2,000 to be fully funded. A pledge of only $12 is needed to secure a PoweriSite of your very own, which sounds very reasonable to me.